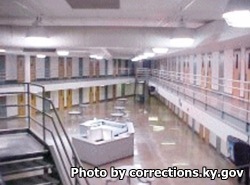 Green River Correctional Complex is located in Central City Kentucky, part of Muhlenberg County. The prison incarcerates approximately 982 adult males who are of medium and minimum custody levels. Inmates who are in one of the three medium custody units are housed in double bunk beds. The segregation unit, which is maximum security, houses inmates in single cells. Offenders who are in the minimum unit are housed in an open dormitory setting. Programs for anger management, drug and alcohol addiction, victim awareness, family reunification and life skills are available to all inmates at Green River Correctional Complex. Adult basic education courses and technical training in a variety of disciplines is available and teaches the inmates new skills they can use after they are released. Visitation occurs on Saturdays and Sundays from 8:30am-2:30pm. You must arrive by 2pm or you will not be allowed to enter the facility. Inmates who are in administrative segregation or disciplinary segregation are only allowed non-contact visits by appointment only.